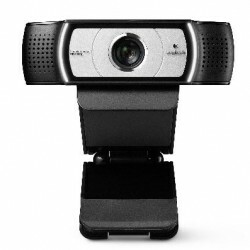 Logitech will soon announce the availability of the C930e, a webcam for professionals dedicated to videoconferencing. Scheduled to be delivered in May, it has a sensor Full HD (1920 x 1080 pixels) coupled to an optical wide-angle 90 degrees. Its functions H.264 SVC video coding and UVC 1.5 5 offload the processor of the computer providing video processing inside the camera. Its glass lens also prevents distortion effect which often suffer wide-angle images. Optimized for Microsoft Lync compatible with Cisco software, Skype and most unified communications applications and video conferencing, the C930e is also equipped with functions pan, tilt and zoom magnification up to 4X. It is equipped with an autofocus function and an external shutter. The integration of Logitech RightLight technology corrects the image in order to improve the quality in low light at various distances from shooting. Compatible with Windows 7, Windows 8 and Mac OS X 10.7 or later, this model is sold 143 $ .